First, you might want to check out this post about the Hebrew calendar (which is quite different from the one we all follow). Get it? Good. Passover, which commemorates the Israelites' departure from Egypt as described in the book of Exodus (Specifically Exodus 5-14), is celebrated for seven days, from the 14th of the Hebrew month of Nisan until the 21st. The regulations for this holiday are expressed several times in the Old Testament - the first time in Exodus 12:14-20. The main one is that nothing leavened is to be eaten - or even found in the home - during the entire weeklong celebration. Observant Jews will thoroughly clean their homes, attempting to remove every crumb of bread, cracker, cake, etc to follow the commands of Exodus 12:15. The formal Passover meal is called a Seder (which, in Hebrew, means "order."). Generally, at least with my family as I grew up, there would be two of these each Passover, and they were quite elaborate and structured (the meal isn't called "order" for nothing!). The Seder instructions can be found in a book called a Haggadah ("telling" in Hebrew). Jews considered reading through the Haggadah as a fulfillment of the Lord's command to tell their children what happened during the Exodus from Egypt (Exodus 13:8). Some of the Seder highlights include drinking four cups of wine (or grape juice if you're little :D), the youngest member of the family's recitation of the Four Questions, spilling a bit of said wine ten times - once for each of the ten plagues, opening the door for Elijah, and MUCH singing. There is also, on the table, a cup of wine for Elijah (this is in reference to the Messiah as mentioned in Malachi 4:5), a Seder plate with many symbolic items on it, and a stack of three pieces of matza. And, for MORE of your listening pleasure - a favorite song from the end of the Seder, called Chad Gadya (One Little Goat)- click on the title to see the lyrics - in English and Hebrew. What about Passover most interested you? Any questions? Thank you for all the great information, Joanne. I love learning about the Hebrew traditions because they make our Christian traditions that much richer! They really do, Glynis. I have attended a couple of "messianic" Seders since I've been saved, and it is so VERY amazing how much "foreshadowing" there is. I was in awe through the whole thing. That doesn't surprise me - even a LITTLE bit - Jen. Have you ever been to a Seder? Guessing you have, knowing you - but if not, DO IT! 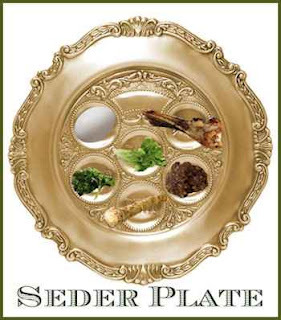 I've heard some explanations of the symbolism of the seder, but I've never been to one. Something that struck me in your post though, isn't really about the main issue. The youngest child recites the four questions. What an amazing way to teach our children God's truths. Instead of having them listen while adults tell them, they have to learn it and then tell the adults. I can picture how that brings them into the practice of the faith in so many ways. We should all use that technique in teaching our children about God. Passing traditions down to your children is a HUGE part of Judaism in general, and Passover in particular. You are very right about it - it makes a huge difference. Hope you CAN attend a seder sometime. It's a very neat experience. Interesting! I love seeing it through a NT viewpoint - knowing the reasoning for the symblisms. I have a question - In Exodus, they ate the meal in a hurry "with their shoes on" and ready to leave. What is the reason for "leaning" while eating? (in the 4 questions) It seems to imply relaxing or resting instead alertness. Great question, Vonnie! The leaning symbolizes the freedom from slavery - not the exodus itself. We recling/lean at the Seder table because God freed us from oppression/slavery. And thanks for stopping by, dear friend! Thanks for sharing, Joanne. I have a Jewish friend, who had me and some other people over for a Seder. It was a wonderful celebration. Aren't they wonderful? So much symbolism and richness. Could have talked for pages and pages more on this. Thanks so much for stopping by!